If you want to get your staff up to speed instantly with amazing clinical images, then the started kit is what you're looking for. 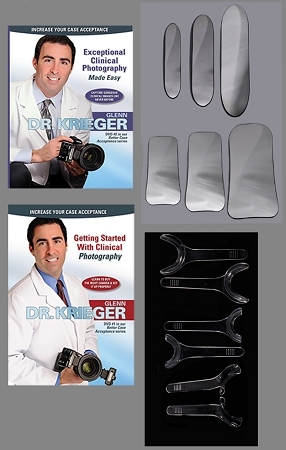 It comes with our two DVDs which will help you understand lighting and mirror and retractor use, as well as a full set of 6 retractors and a full set of 6 mirrors. Aside form Dr. Krieger being there to actually take the photos for you, this is the next best thing.